After months of uncertainty, speculation and even protest, the reform of the IR35 legislation for the public sector in the shape of the off- payroll rules takes effect today, April 6th, writes Graham Fisher, managing director of Orange Genie. Up until April 6thin the public sector, it was the contractor’s responsibility to decide if their contract fell inside or outside IR35, and if they got it wrong their limited company (also known as a PSC) was liable for any unpaid tax. But from now on (the beginning of tax year 2017/18), the responsibility for the decision falls on the end-client, at least if they are a public sector body. For the purpose of this reform, the public sector includes organisations covered by the Freedom of Information Act (2000). If you’re not sure if this applies to your client, the easiest way to check is to ask the end-client or your agency. If your public sector end-client decides that you are inside IR35, gross payments to your limited company will no longer be allowed. The agency or end client will have to run a deemed salary calculation and tax you as if you were an employee, so tax and national insurance will be deducted before your limited company is paid. You’ll also no longer be allowed to claim the 5% allowance for company running costs, which you were previously entitled to when working inside IR35 (although this allowance remains in place in the private sector). A lot has already been written to answer this question of what contractors should do next. The following illustration should therefore provide some light relief (notes and explanations to Figure 1 are below it however). As the chart shows, once you’ve established that the changes apply to your end client, the next step is for you to get the decision on whether your assignment falls inside or outside IR35. If you don’t have this already (many client-bodies told their contractors their status in advance of April 6th), you should contact your agency or client right away. These parties can no longer pay you correctly without this information. If the decision is ‘outside IR35’ then it’s business as usual; you will invoice your agency or client in the normal way. You will be paid gross and account for taxes on the basis that you’re outside IR35. However if you’ve been working outside IR35 and your end-client has decided that you’re now inside, you should strongly consider seeking external advice from an accounting or status specialist. They can discuss your particular situation and advise you of the best way to work. A less sophisticated but more immediate take on your status can be obtained by you using the IR35 digital tool, known as the ESS (Employment Status Service). You can leave your current contract and seek another that will be deemed outside IR35, or seek alternative work in the private sector (where IR35, but not these off-payroll rules, also potentially applies). You can continue to work through your limited company (agency and client policy permitting) and operate IR35. The updated IR35 legislation for the public sector calls for “reasonable care” in determining IR35 status, so if you think your end-client has made a mistake – or not taken reasonable care in assessing your status – then it’s worth asking them to re-evaluate it, as Figure I shows. 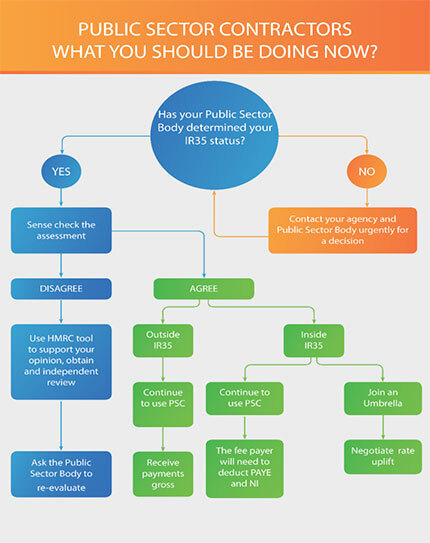 If you find yourself needing to do this, or if you’re unsure what your status should be, HMRC’s IR35 tool could be useful. Many experts view it as flawed, so it shouldn’t be taken as the final word, However as mentioned previously, it is a good place to start, particularly as HMRC have promised to stand by its results if the information inputted is correct. You might also consider getting an independent, in-depth IR35 assessment by a specialist, which could add considerable weight to your argument if it supports your view. Ultimately, the decision lies with the public sector body, and all you can really do is attempt to influence it. What if the decision still stands? Assuming you wish to stay with your current client, a simple take-home pay comparison we have calculated shows that many contractors will be better-off with an umbrella company, than they will be working through a limited company inside IR35. But you might want to keep your limited company if there’s a chance that future contracts will be outside, particularly if you also work in the private sector where you still get to make the decision about your status yourself. Whether you’ve decided to soldier on with your limited company or make the jump to umbrella, your take-home pay is going to take a hit under these new off-payroll rules. As a result, many contractors will be hoping to negotiate a rate uplift to protect their earnings and you may want to join them (see Figure 1). At this very early stage of the new IR35 legislation for the public sector, it’s difficult to say what the long term results of this change will be. We’ve seen many contractors successfully negotiating uplifted rates, and we’ve also seen many making the move to the private sector. It’s possible we’re looking at a choice between higher public sector rates or a serious skills shortage in public sector projects. Only time will tell which way the pendulum will swing, or indeed if other, unforeseen consequences will emerge. What is certain is that the new rules are now in place, and public sector PSCs, their agencies and clients -- regardless of industry, will have to find a way to live with them.